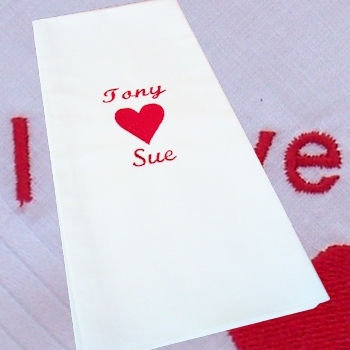 Love Heart personalised cotton tea towel embroidered with a name or little message to make a truly special gift. 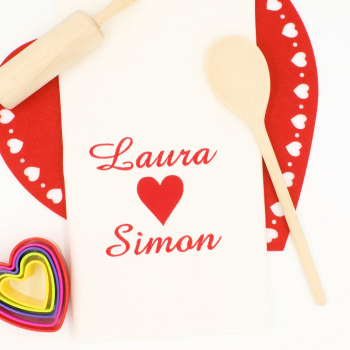 Love Heart personalised cotton tea towel embroidered with a name or little message to make a truly special gift. Unique and useful gift idea for men or women even for a wedding anniversary or Valentines Day! We use natural cotton tea towels hemmed on all the sides. You may request a thread colour for the text and the heart motif by filling in the thread colour box at the bottom of this screen. We offer two different text styles - fancy script or print.